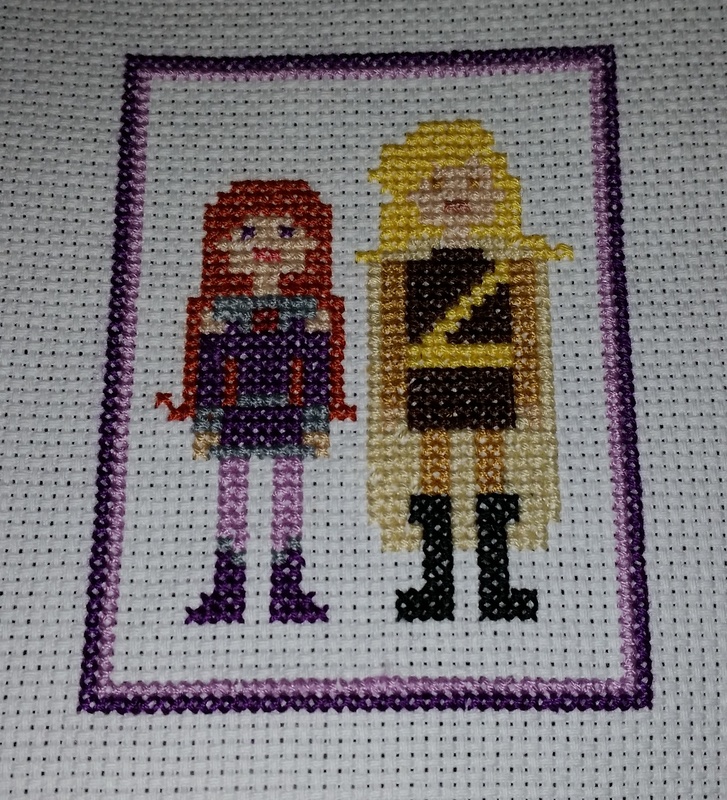 I’m still working on a larger cast of characters Amethyst Princess of Gemworld cross stitch, but I took some time out to make a DC Nation Amethyst and Topaz. I made it for Brianne! Unfortunately, I didn’t realize that the proportions of the border I originally put around the picture would look odd once I put the piece in a frame, so the border came out. 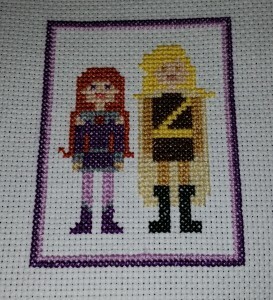 These superhero designs were modified from a pattern I bought from weelittlestitches on etsy. If you can’t find the comic book merchandise you want, make it yourself! This entry was posted in comics and tagged Amethyst Princess of Gemworld on 5/6/2015 by Anna. Check out this interview with Brianne Drouhard about the DC Nation Amethyst shorts and other things over on Comics Alliance. The post includes an extensive art gallery too! This entry was posted in comics and tagged Amethyst Princess of Gemworld on 7/13/2014 by Anna. It is no secret I am a big fan of Brianne Drouhard, whose work on the animated Amethyst shorts was absolutely charming. So I was excited to see that she’s launched her Harpy Gee webcomic on Dumm Comics! Check it out, and read Brianne’s blog post for more details and mega cute bonus illustrations! This entry was posted in comics on 1/6/2014 by Anna. My friend Mark alerted me to the cute mini prints Joel Carroll is selling in his Society6 shop. There’s an Amethyst one! This entry was posted in comics and tagged Amethyst Princess of Gemworld on 7/6/2013 by Anna. I accidentally blew away most of the images on this blog and have been adding them back to my Amethyst posts. 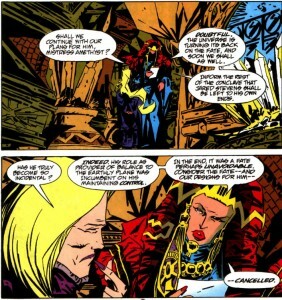 I just realized that I hadn’t actually finished covering the very odd time Amethyst popped up in the Convergence/Book Of Fate/Weirodoverse crossover issues in the 90s. 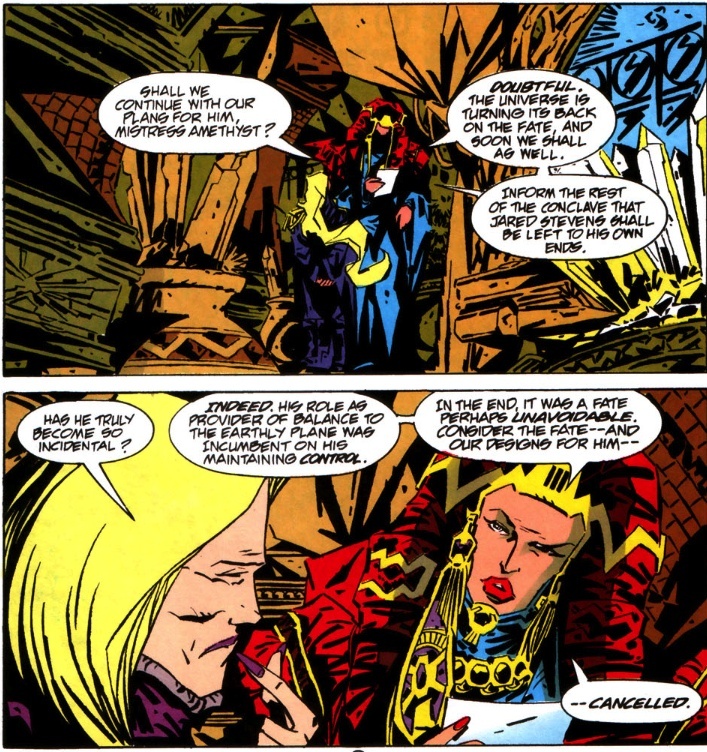 Amethyst does appear briefly at the end of Book of Fate 8, where she takes a bath, evilly. She shows up again to flirt with Fate in an ill-fitting purple bikini. Other things happen, and eventually Fate gets sent to a future alien plant to hang out with Lobo!? I was really not paying very close attention at this point, but Amethyst does show up again as an old lady. And that’s about it, for Amethyst appearances in this obscure corner of the 1990s. 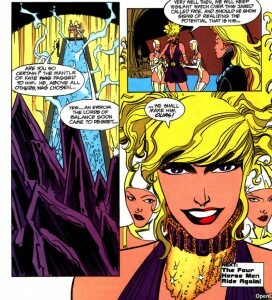 I do plan to cover some of the Amethyst references in Legion of Super-Heroes soon. This entry was posted in comics and tagged Amethyst Princess of Gemworld on 7/4/2013 by Anna. Here’s something fun, it is a sketch of Amethyst by Chris Haley! Chris’ Etsy store has a great selection of prints. I bought Sad Batman and Superman: Flying is the best, which I intend to frame one day and place in my Nerd/Crafting Room, once I have a house big enough to support me having a Nerd/Crafting room. This entry was posted in comics and tagged Amethyst Princess of Gemworld, awesome on 5/29/2013 by Anna. I keep meaning to do a bit more with this blog but life is pretty hectic right now. But for something fun to do, you can head on over to the DC Nation Animated Shorts page and vote for Amethyst as often as you would like to. This entry was posted in comics and tagged Amethyst Princess of Gemworld on 4/24/2013 by Anna. 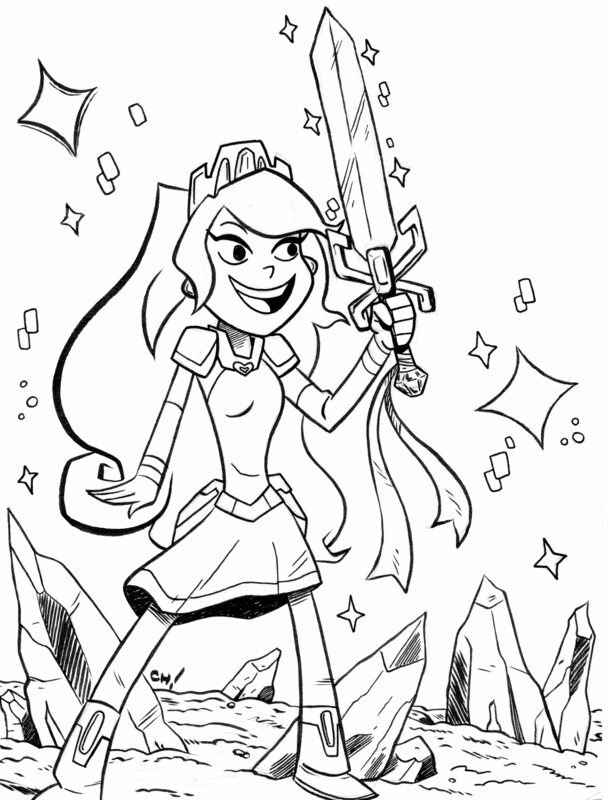 Also, be sure to check out Brianne Drouhard’s blog for plenty of Amethyst sketch goodness. This entry was posted in comics and tagged Amethyst Princess of Gemworld on 3/24/2013 by Anna. Sword of Sorcery‘s cancellation was recently announced. I can’t say I’m particularly surprised, as I’ve heard that the sales on the title were not good. I wonder if it would have done better at a lower price point without being split into a shorter main story + backup story. I really wish that DC had developed more of an all-ages title built around the cartoon shorts, because they really have that extra spark that could inspire more fans. Sword of Sorcery I was reading just out of a general sense of resignation because I wanted to see what would happen with this revised Amethyst character. This entry was posted in comics and tagged Amethyst Princess of Gemworld on 2/12/2013 by Anna. 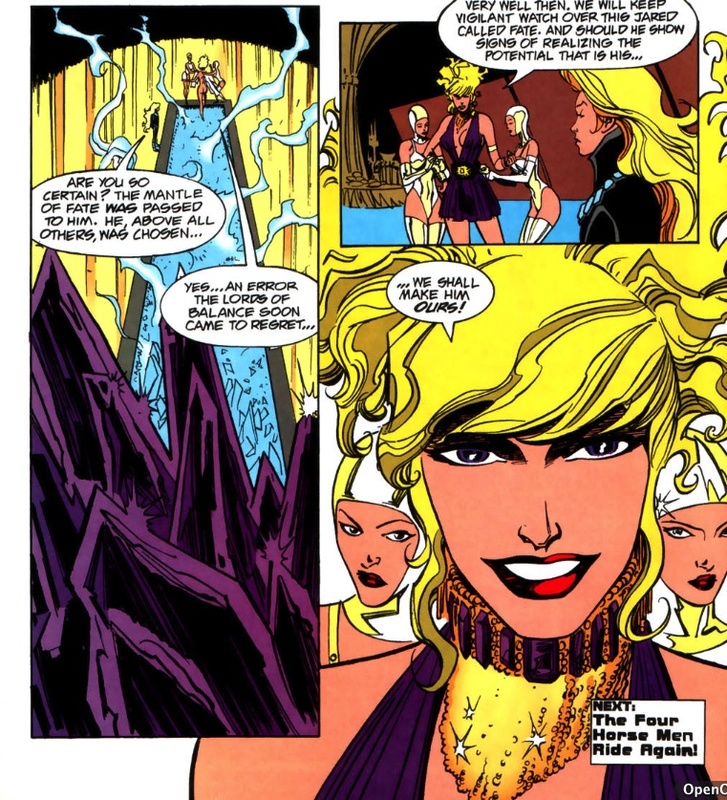 This entry was posted in comics and tagged Amethyst Princess of Gemworld on 1/19/2013 by Anna.